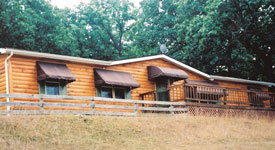 While visiting High Adventure Ranch, you’ll be staying in one of our 5 cabins, lodge, lake house or loft. Costs for each are $150 per night, including meals, which are served in the Dining Hall. 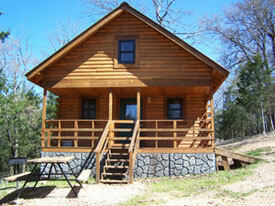 Or, you can do your own cooking while at the ranch and we only charge $100.00 per night. 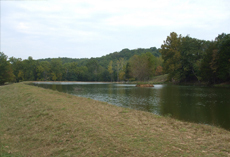 There's nothing like a cabin in the woods when you're hunting or fishing and with our newly constructed units, you’ll get in touch with nature while enjoying all of the amenities of home. Cost is $150 including meals, or $100 per night without meals. The trophy-studded walls are breathtaking. It also has a big screen TV that helps pass the time between hunts in the evenings. 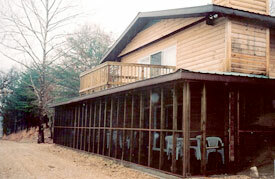 Our new Lake House sleeps up to 6 people comfortably and features a second floor walkout porch and the spacious outdoor screened in area on the main level. 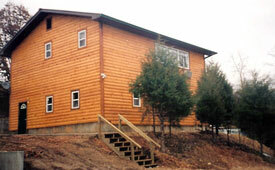 The nicest aspect of the Lake Loft is the breathtaking view it provides. The oversize viewing window gives you an unbelievable view of the big game approaching the lake, located just fifty yards away. 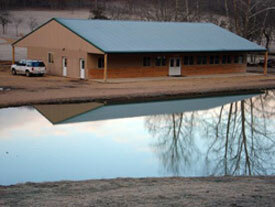 The new Dining Hall was completed in the Fall of 2007 and can accommodate large groups. The Kitchen and Dinning room await our hungry hunters with three home cooked meals each day. The only thing better than the hunting on our ranch is the food!